Learning to build relationships is a skill to carry into adulthood. Being connected to a network of people is critical to growth and success in all parts of our lives. But how can we help students engage in meaningful connection and build purposeful school relationships? 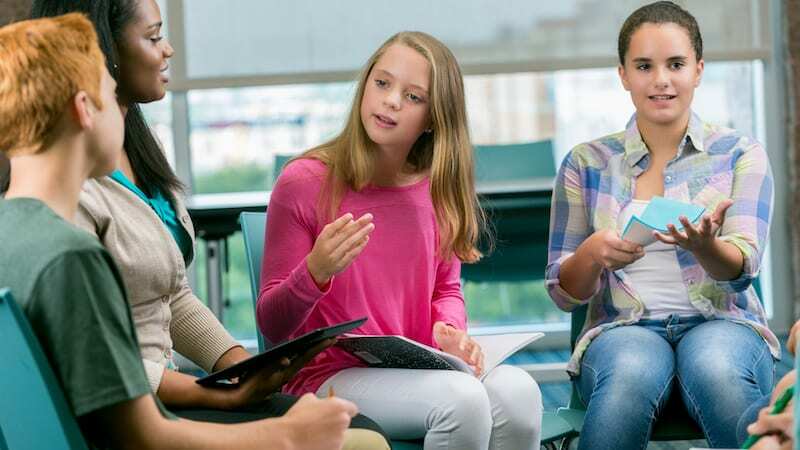 Instead of saying, “What’s in it for me?” students should ask, “How can I help and be supportive of other people?” Our elementary school has practiced this in the form of our “Connections” groups for over 10 years. It has truly shaped the way students value all relationships with purpose and meaning. Make the time to build school relationships. Planning connection opportunities for students is the most challenging and time-consuming piece to it all. Each year becomes more manageable, and it adds incredible value and depth to our school community. We use summer to decide what our connections groups focus areas will be. We have focused on author studies, building social skills, and increasing access to multicultural titles. This year, we’re trying STEM engineering activities in a more purposeful manner, while connecting them to children’s literature. Each student is placed in a peer group with a teacher adviser. An all-available-hands-on deck approach is necessary from your teaching faculty and staff to ensure student engagement. Set groups at about 12 to 15 students in size. It’s also great if you mix grades levels, with two to three students from each grade. To not disrupt times for art, P.E., music and library, our teachers hold connection time during the Morning Meeting block, as a commitment to using the Responsive Classroom approach. While we have a planned book and some lesson planning involved, we let the students drive the conversation. Your talking points will be there to help to keep it vibrant and active. Be flexible for growth to build school relationships. Productive teacher feedback and the willingness to problem solve have made a huge impact on our ability to bridge any gaps. At times we’ve switched up yearly goals to help us reach cohesiveness. One year, we started with an author study for our students that included stories that would be accessible to students in every grade level. The next year we used our groups to meet a school improvement goal to refocus our commitment to responsive classroom. Principals that can think ahead and budget for books and supplies ahead of time will no doubt have the flexibility to shift when connection goals require a fresh approach and redirection to keep students engaged. The student and teacher check ins occur informally throughout the building when students see each other passing in the hallway, during recess, and on the school bus. Successfully, they continue beyond the walls and confines of the school day and scholastic year. A fourth grade teacher shared that she understood the powerful impact of the connections groups over the summer. A student ran over to her in the grocery store to say “hello” and introduce the teacher to her mother as her connections teacher. These stories are commonplace and a gift, reminding us why we do what we do. The beautiful payoff to our programming is that this student knows she has another adult and other students in the building that will see her through her time at our school. It’s her grounding, long-lasting support system. I firmly believe in the words of Maya Angelou, “People will forget what you said, people will forget what you did, but people will never forget how you made them feel.” Relationships matter, and our students want to be connected, seen and heard, and feel like they belong. Plus, how technology can improve student-teacher relationships. Elementary school principal for the past 10 years, elementary assistant principal for 6 years, and classroom teacher for 5 years.